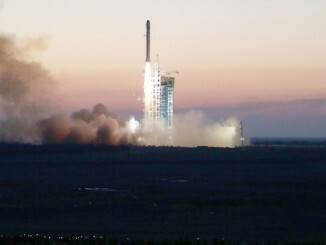 China debuted a new solid-fueled booster Thursday in an unannounced flight that put a small satellite into polar orbit, adding another rocket to the country’s growing fleet of lightweight launchers. The KT-2 rocket lifted off at 2353 GMT (6:53 p.m. EST) Thursday from the Jiuquan space center, a military-run base in northwestern China’s Gobi Desert, according to a report from the government-owned Xinhua news agency. The secretive launch occurred at 7:53 a.m. Beijing time Friday without an official announcement ahead of time, other than a notice to pilots published two days before the mission warning of drop zones for the KT-2’s spent motor casings. Little is known about the KT-2 rocket’s design. The multi-stage booster could be based on technology developed for the Chinese military’s road-mobile DF-31 ballistic missile, with the addition of an upper stage to place an object into orbit. Chinese social media accounts shared several photos appearing to show the KT-2 launch around sunrise at Jiuquan. 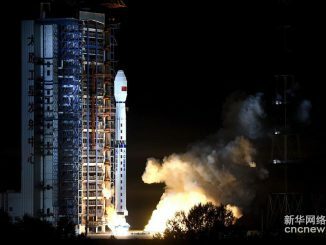 Xinhua reported the rocket was developed by China Aerospace Science & Industry Corp., or CASIC, with the intention of eventually launching commercial satellites. China has developed several new small satellite launchers in recent years. The Long March 11 rocket, managed by the China Academy of Launch Vehicle Technology, another state-owned space contractor, debuted in 2015. The Kuaizhou 1 booster, another CASIC product, has launched satellites three times since 2013 with two different variants. 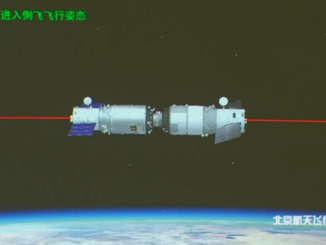 The payload aboard the KT-2 launch was a small satellite named TK-1, the first spacecraft independently developed by CASIC, Xinhua reported. The TK-1 satellite “will be used for remote sensing, telecommunications and experiments in minisatellite-based technologies,” the news agency said. The U.S. military’s satellite tracking network detected two objects from the launch. One of the objects, likely the payload, is in a near-circular orbit ranging in altitude from 236 miles (381 kilometers) to 250 miles (403 kilometers) with an inclination of 96.9 degrees to the equator. Another object, believed to be the KT-2’s upper stage, was found in a lower orbit, positioned to expedite its re-entry into Earth’s atmosphere, a common tactic to minimize space debris. The KT-2’s inaugural mission was the third Chinese space launch of the year, and the second from Jiuquan.